Today is European Restart a Heart Day. This is an initiative founded by the European Resuscitation Council with the European parliament’s support. Taking place every year on the 16th October, the goal of the campaign is to create awareness that everyone can learn CPR. Furthermore, the aim is to push Basic Life Saving Skills in schools and public locations. 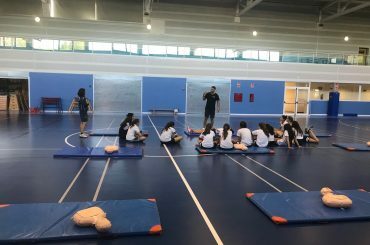 In recognition of Restart a Heart Day, two weeks ago we delivered a basic CPR skills session to groups of year 8 and 9 students at a school in Madrid. Over 200 children were split into groups of 20 – 30. The students were taught how to deal with an unresponsive, non-breathing casualty and how to perform CPR. Additionally, instruction on communicating with the emergency services, basic hygiene, staying safe and the recovery position. The students showed enthusiasm and skill when they practiced on the resuscitation dolls. They asked us many questions and were keen to learn about first aid. On the whole, the day was a great success. We are proud that 200 plus children gained a very important life skill.